This is a complete list of Pokémon, fictional creatures from the Pokémon series. This list covers over 600 Pokémon species. 122 Mr. Mime Barrierd 158 – 095 – – 114 – 122bEgg/Mime Jr.
Magearna† Magiana – – – – – – – ??? *These pre-evolved Pokémon were introduced in generations following introduction of the species they evolve into (and after the 2nd, which introduced breeding). The pre-evolutions will only hatch from eggs produced under special conditions. All other eggs will hatch directly into the next stage of evolution. †Marked as Mythical Pokémon for at least one game entry. These Pokémon cannot be encountered and caught in the course of normal gameplay, and does not affect the completion of Pokédex. They are officially only made available via promotional events, or transferred from a previous version or spin-off titles under certain conditions. Lugia and Ho-Oh are special cases in that are Mythical only in Game Boy Advance (GBA) versions but legendary in other versions, where they can be obtained by normal gameplay. ‡In Pokémon Black and White, Zorua and Zoroark cannot be encountered and caught in the course of normal gameplay without trading or obtaining them from promotional distributions. However, Zorua and Zoroark are not Mythical Pokémon, because they are required to complete the Pokédex in Pokémon Black and White. ↑ 1.00 1.01 1.02 1.03 1.04 1.05 1.06 1.07 1.08 1.09 1.10 1.11 1.12 "キメわざポケモンキッズDP3". Bandai Co., Ltd. (via WebCite). June 2009. Retrieved 28 July 2010. ↑ "Pokémon! Kimi ni Kimeta!". Pocket Monsters. No. 1, season 1. ↑ 4.0 4.1 "キメわざポケモンキッズDP6". Bandai Co., Ltd. September 2010. ↑ 5.0 5.1 5.2 5.3 5.4 5.5 5.6 5.7 5.8 "キメわざポケモンキッズ7". Bandai Co., Ltd. (via WebCite). September 2007. Retrieved 28 July 2010. ↑ 7.0 7.1 7.2 7.3 7.4 "Meiji VS Cards". Meiji (via WebCite). 13 April 2012. Retrieved 30 March 2012. ↑ 8.0 8.1 8.2 8.3 8.4 8.5 8.6 8.7 8.8 8.9 "キメわざポケモンキッズ5". Bandai Co., Ltd. (via WebCite). October 2006. Retrieved 28 July 2010. ↑ 10.0 10.1 10.2 "Index of /wp-content/uploads/2010/12". 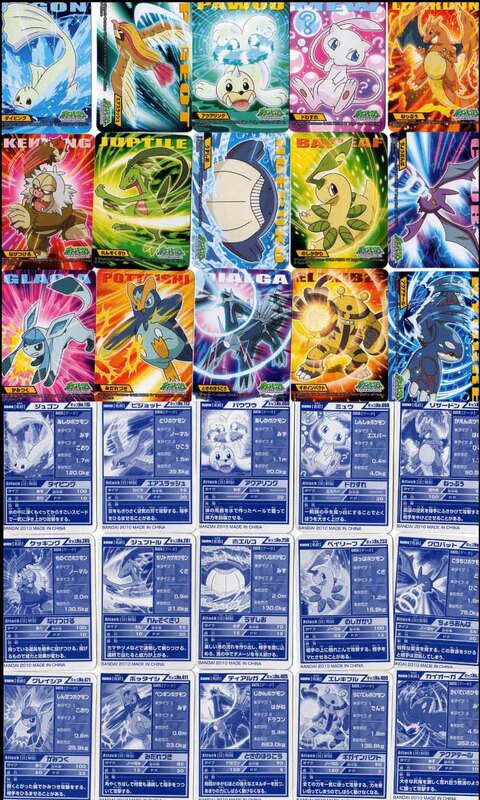 Ptcg.creatures.co.jp. Retrieved 5 April 2011. ↑ "かくれとくせい」にクローズアップ！". Monthly PGL. The Pokémon Company. December 2010. Retrieved 3 December 2010. ↑ 12.0 12.1 12.2 12.3 12.4 12.5 12.6 "キメわざポケモンキッズ6". Bandai Co., Ltd. (via WebCite). March 2007. Retrieved 28 July 2010. ↑ 13.00 13.01 13.02 13.03 13.04 13.05 13.06 13.07 13.08 13.09 13.10 13.11 "丸美屋ゲットシール". Maruiya (via WebCite). December 2009. Retrieved 30 March 2012. ↑ 15.0 15.1 15.2 15.3 15.4 15.5 15.6 15.7 "Meiji Blue Cards". Meiji (via WebCite). 13 April 2012. Retrieved 30 March 2012. ↑ 16.00 16.01 16.02 16.03 16.04 16.05 16.06 16.07 16.08 16.09 16.10 16.11 16.12 16.13 16.14 16.15 16.16 16.17 16.18 16.19 16.20 16.21 16.22 16.23 16.24 16.25 16.26 16.27 16.28 16.29 16.30 16.31 16.32 16.33 16.34 16.35 16.36 16.37 16.38 16.39 16.40 16.41 16.42 16.43 16.44 16.45 16.46 16.47 16.48 16.49 16.50 16.51 16.52 16.53 16.54 16.55 16.56 16.57 16.58 16.59 16.60 16.61 16.62 16.63 16.64 16.65 16.66 16.67 16.68 16.69 16.70 16.71 16.72 16.73 16.74 16.75 16.76 16.77 16.78 16.79 16.80 16.81 16.82 16.83 16.84 16.85 16.86 16.87 16.88 16.89 16.90 16.91 16.92 16.93 16.94 16.95 16.96 16.97 16.98 "ポケモンプリントギャラリー". Canon. Retrieved 2 November 2014. ↑ 18.0 18.1 18.2 18.3 18.4 18.5 18.6 18.7 "キメわざポケモンキッズ8". Bandai Co., Ltd. (via WebCite). March 2008. Retrieved 28 July 2010. ↑ 19.0 19.1 "2000年 結晶塔の帝王". ポケットモンスターオフィシャルサイト. The Pokémon Company. Retrieved 30 December 2010. ↑ 20.00 20.01 20.02 20.03 20.04 20.05 20.06 20.07 20.08 20.09 20.10 20.11 "キメわざポケモンキッズ2". Bandai Co., Ltd. (via WebCite). January 2006. Retrieved 28 July 2010. ↑ 21.00 21.01 21.02 21.03 21.04 21.05 21.06 21.07 21.08 21.09 21.10 21.11 21.12 21.13 21.14 "キメわざポケモンキッズDP5". Bandai Co., Ltd. (via WebCite). May 2010. Retrieved 28 July 2010. ↑ 22.00 22.01 22.02 22.03 22.04 22.05 22.06 22.07 22.08 22.09 22.10 22.11 22.12 22.13 22.14 "キメわざポケモンキッズ4". Bandai Co., Ltd. (via WebCite). July 2006. Retrieved 28 July 2010. ↑ 23.0 23.1 23.2 23.3 23.4 23.5 "ポケモンメダルコレクション ダイヤモンド＆パール４". Bandai Co., Ltd. Retrieved 18 April 2011. ↑ "2001年 セレビィ 時を超えた遭遇". ポケットモンスターオフィシャルサイト. The Pokémon Company. Retrieved 30 December 2010. ↑ 25.00 25.01 25.02 25.03 25.04 25.05 25.06 25.07 25.08 25.09 25.10 25.11 "キメわざポケモンキッズDP4". Bandai Co., Ltd. (via WebCite). December 2009. Retrieved 28 July 2010. ↑ 26.00 26.01 26.02 26.03 26.04 26.05 26.06 26.07 26.08 26.09 26.10 26.11 26.12 26.13 "キメわざポケモンキッズ". Bandai Co., Ltd. (via WebCite). October 2005. Retrieved 28 July 2010. ↑ "Pokemon Center 2014 Gardevoir Mega Gardevoir A4 Size Clear File Folder". Pokémon with You. Retrieved 21 Oct 2014. ↑ 35.00 35.01 35.02 35.03 35.04 35.05 35.06 35.07 35.08 35.09 35.10 35.11 35.12 "キメわざポケモンキッズDP". Bandai Co., Ltd. (via WebCite). December 2008. Retrieved 28 July 2010. ↑ 36.0 36.1 "「シングルバトル 最強クラスのポケモン」をレベル100でプレゼントすることが決定！　全国のポケモンセンターで受け取ろう！". September 15, 2012. Archived from the original on February 9, 2014. ↑ 38.0 38.1 38.2 "キメわざポケモンキッズ3". Bandai Co., Ltd. (via WebCite). April 2006. Retrieved 28 July 2010. ↑ 41.00 41.01 41.02 41.03 41.04 41.05 41.06 41.07 41.08 41.09 41.10 41.11 "キメわざポケモンキッズDP2". Bandai Co., Ltd. (via WebCite). March 2009. Retrieved 28 July 2010. ↑ "Pokémon Black Version and Pokémon White Version | Victini". Retrieved 7 February 2011. ↑ 62.0 62.1 62.2 "Starter Pokémon". Pokémon Black Version and Pokémon White Version: Official Video Game Site. The Pokémon Company International, Inc. Retrieved 23 November 2010. ↑ 63.00 63.01 63.02 63.03 63.04 63.05 63.06 63.07 63.08 63.09 63.10 63.11 63.12 63.13 63.14 63.15 63.16 63.17 "ポケモンメダルコレクション ベストウイッシュ". Bandai Co., Ltd. Archived from the original on 30 December 2010. Retrieved 6 October 2010. ↑ "Pokémon Black Version and Pokémon White Version | Patrat". Retrieved 14 November 2011. ↑ "Pokémon Black Version and Pokémon White Version | Watchog". Retrieved 7 February 2011. ↑ "Pokémon Black Version and Pokémon White Version | Lillipup". The Pokémon Company International, Inc. Retrieved 10 February 2011. ↑ "Pokémon Black Version and Pokémon White Version | Herdier". The Pokémon Company International, Inc. Retrieved 10 February 2011. ↑ "Pokémon Black Version and Pokémon White Version | Purrloin". Retrieved 10 February 2011. ↑ "Pokémon Black Version and Pokémon White Version | Liepard". Retrieved 10 February 2011. ↑ "Pokémon Black Version and Pokémon White Version | Pansage". Retrieved 7 February 2011. ↑ "Pokémon Black Version and Pokémon White Version | Pansear". Retrieved 10 February 2011. ↑ "Pokémon Black Version and Pokémon White Version | Panpour". Retrieved 10 February 2011. ↑ "Munna". Pokémon Black Version and Pokémon White Version: Official Video Game Site. The Pokémon Company International, Inc. Retrieved 27 December 2010. ↑ "Pokémon Black Version and Pokémon White Version | Musharna". Retrieved 14 November 2011. ↑ "Pidove". Pokémon Black Version and Pokémon White Version: Official Video Game Site. The Pokémon Company International, Inc. Retrieved 27 December 2010. ↑ 89.0 89.1 89.2 89.3 89.4 89.5 89.6 89.7 89.8 89.9 "ポケモンメダルコレクション ベストウイッシュ2". Bandai Co., Ltd. Retrieved 28 January 2011. ↑ 90.0 90.1 90.2 "ポケモンしょうひん ゲーム". Takara Tomy. Retrieved 26 May 2011. ↑ "Blitzle". Pokémon Black Version and Pokémon White Version: Official Video Game Site. The Pokémon Company International, Inc. Retrieved 27 December 2010. ↑ 92.0 92.1 92.2 92.3 92.4 92.5 92.6 "Pokémon Black and White merchandise". Retrieved 15 March 2010. ↑ "Gigalith". Pokémon Black Version and Pokémon White Version: Official Video Game Site. The Pokémon Company International, Inc. Retrieved 27 December 2010. ↑ "Pokémon Black Version and Pokémon White Version | Woobat". Retrieved 14 November 2011. ↑ "Pokémon Black Version and Pokémon White Version | Drilbur". Retrieved 14 November 2011. ↑ "Pokémon Black Version and Pokémon White Version | Excadrill". Retrieved 7 February 2011. ↑ "Pokémon Black Version and Pokémon White Version | Audino". Retrieved 10 February 2011. ↑ 100.00 100.01 100.02 100.03 100.04 100.05 100.06 100.07 100.08 100.09 100.10 100.11 100.12 100.13 100.14 100.15 100.16 100.17 100.18 100.19 100.20 100.21 100.22 100.23 Pokémon Smash!. 9 September 2011. ↑ "Pokémon Black Version and Pokémon White Version | Sewaddle". Retrieved 7 February 2011. ↑ "Pokémon Black Version and Pokémon White Version | Basculin". Retrieved 7 February 2011. ↑ "Sandile". Pokémon Black Version and Pokémon White Version: Official Video Game Site. The Pokémon Company International, Inc. Retrieved 27 December 2010. ↑ "Darmanitan". Pokémon Black Version and Pokémon White Version: Official Video Game Site. The Pokémon Company International, Inc. Retrieved 27 December 2010. ↑ "Pokémon Black Version and Pokémon White Version | Yamask". Retrieved 10 February 2011. ↑ "Pokémon Black Version and Pokémon White Version | Cofagrigus". Retrieved 14 November 2011. 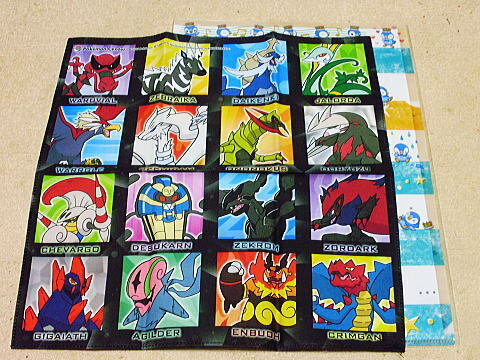 ↑ 107.0 107.1 107.2 107.3 "Pokémon Black and White merchandise". Retrieved 6 April 2011. ↑ 108.0 108.1 "Two New Dark-Type Pokémon Come to Light". pokemon.com. The Pokémon Company International, Inc. 6 December 2010. Retrieved 6 December 2010. ↑ "Minccino". Pokémon Black Version and Pokémon White Version: Official Video Game Site. The Pokémon Company International, Inc. Retrieved 27 December 2010. ↑ "Pokémon Black Version and Pokémon White Version | Gothitelle". Retrieved 14 November 2011. ↑ 112.0 112.1 112.2 Pokémon Smash!. 10 October 2010. ↑ "Pokémon Black Version and Pokémon White Version | Reuniclus". Retrieved 14 November 2011. ↑ "Pokémon Black Version and Pokémon White Version | Swanna". Retrieved 7 February 2011. ↑ "Pokémon Black Version and Pokémon White Version | Deerling". Retrieved 7 February 2011. ↑ "Pokémon Black Version and Pokémon White Version | Sawsbuck". Retrieved 10 February 2011. ↑ "Pokémon Black Version and Pokémon White Version | Emolga". Retrieved 10 February 2011. ↑ "Pokémon Black Version and Pokémon White Version | Alomomola". Retrieved 7 February 2011. 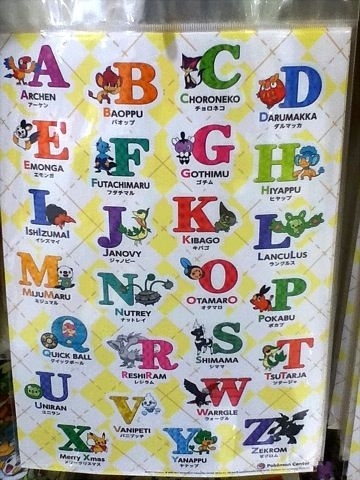 ↑ "Pokémon Black Version and Pokémon White Version | Galvantula". Retrieved 10 February 2011. ↑ "Klink". Pokémon Black Version and Pokémon White Version: Official Video Game Site. The Pokémon Company International, Inc. Retrieved 27 December 2010. ↑ "Pokémon Black Version and Pokémon White Version | Axew". Retrieved 14 November 2011. ↑ "Pokémon Black Version and Pokémon White Version | Fraxure". The Pokémon Company International, Inc. Retrieved 10 February 2011. ↑ "Pokémon Black Version and Pokémon White Version | Haxorus". The Pokémon Company International, Inc. Retrieved 10 February 2011. ↑ "Pokémon Black Version and Pokémon White Version | Braviary". Retrieved 14 November 2011. ↑ 130.0 130.1 "A New Generation of Pokémon...An All-New Adventure!". pokemon.com. The Pokémon Company International, Inc. 28 May 2010. Retrieved 27 July 2010. ↑ 132.0 132.1 132.2 132.3 132.4 132.5 "Pokémon Direct – 1 August 2013". Nintendo. 8 January 2013. Retrieved 9 January 2013. ↑ 134.0 134.1 134.2 "Starters". Pokemon.com. Retrieved 14 September 2013. ↑ 135.00 135.01 135.02 135.03 135.04 135.05 135.06 135.07 135.08 135.09 135.10 135.11 135.12 135.13 "ポケットモンスターXY 100円カプセル ポケメタルコレクションXY -Pocket Monster-(P0080436)". Retrieved 20 November 2013. ↑ "Brigarron with You". Pokémon with You. Retrieved 19 Oct 2014. ↑ "Mahoxy with You". Pokémon with You. Retrieved 19 Oct 2014. ↑ 140.00 140.01 140.02 140.03 140.04 140.05 140.06 140.07 140.08 140.09 140.10 140.11 140.12 140.13 140.14 140.15 140.16 140.17 140.18 140.19 140.20 140.21 140.22 140.23 140.24 140.25 140.26 140.27 140.28 140.29 140.30 "More Pokémon". Pokemon.com. Retrieved 14 August 2013. ↑ "Pokémon X and Pokémon Y: Honedge Revealed!". YouTube. 5 July 2013. Retrieved 14 July 2013. ↑ "Chigoras with You". Pokémon with You. Retrieved 19 Oct 2014. ↑ "ipdl". Retrieved 20 November 2013. ↑ "ExtremeSpeed Genesect: Mewtwo Awakens stickers". Retrieved 15 April 2013. ↑ "Luchabull with You". Pokémon with You. Retrieved 19 Oct 2014. ↑ "Melecie with You". Pokémon with You. Retrieved 19 Oct 2014. ↑ "Numelgon with You". Pokémon with You. Retrieved 19 Oct 2014. ↑ 166.0 166.1 "New Legendary Pokémon!". Pokemon.com. Retrieved 14 August 2013. ↑ "The Mythical Pokémon Diancie". Pokémon.com. Retrieved 15 March 2014. ↑ "Diancie with You". Pokémon with You. Retrieved 19 Oct 2014. ↑ "The Mythical Pokémon Hoopa Appears!". 13 January 2015. Retrieved 14 January 2015. This page was last changed on 1 October 2018, at 01:32.